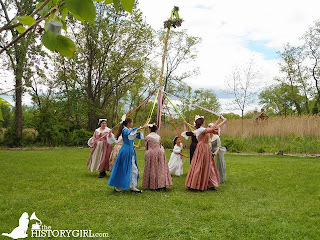 Weekend Historical Happenings: 5/16/15 - 5/17/15 ~ The History Girl! Discover the early industries along the Black River on Saturday from 10:00 am - 12:00 noon. This is a 3.5-mile moderate walk along the Hacklebarney Branch of the railroad, lower millpond, mid-1800s iron mining and bloomer forge, and Kay’s dam. Meet in the Cooper Gristmill parking lot. The mill opens after the walk. Cost: $5 per family. The Cooper Gristmill is located at 66 Route 513, Chester, NJ. For more information and to register, call 908-879-5463 or visit www.morrisparks.net. Enjoy food demonstrations and fitness programs featuring vendors from health and wellness organizations at Fosterfields Living Historical Farm from 11:00 am - 4:00 pm. Also, check out activities on the farm, and cooking in the Farmhouse, from 1:00 - 3:00 pm. On Saturday, Peter Osborne will present a PowerPoint presentation titled, "So Many Brave Men: A History of the Battle at Minisink Ford." The Battle of Minisink Ford is the only Revolutionary War battle to take place in the Upper Delaware Valley. 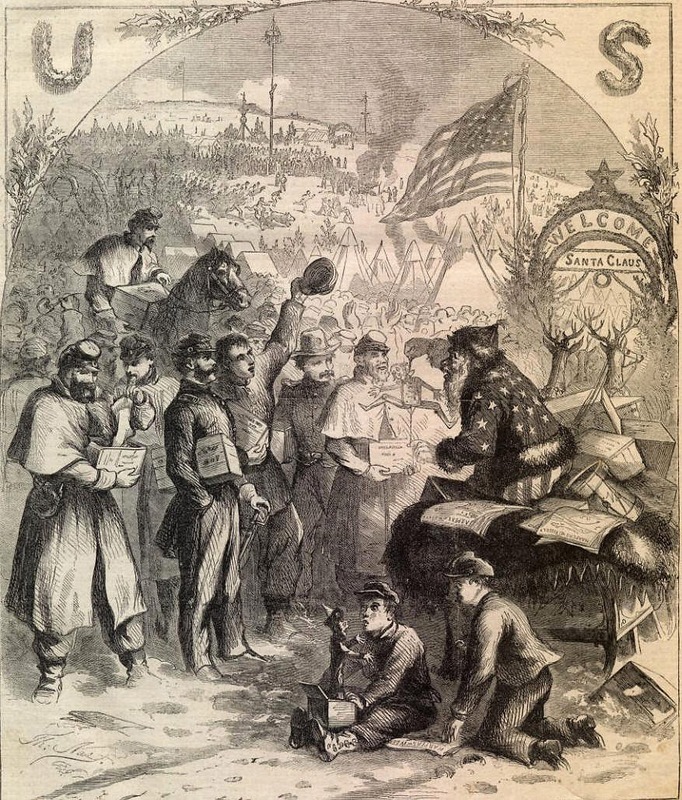 The program will discuss the history of the battle and the importance of it on the lives of the settlers who lived in the valley during the Revolutionary War and includes a handout. This program will be held at the Visitor Center Museum in Washington Crossing State Park, 355 Washington Crossing Pennington Road, Titusville, NJ. For more information, call 609-737-0623. 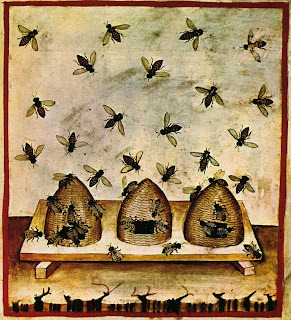 On Saturday, the Burlington County Historical Society presents "What's the buzz about bees?" with Bob Hughes, beekeeper for 35 years and former President of the New Jersey Bee Keepers Association. Get a chance to get up close to a beehive (don't worry--it's empty). Try a sample of honey! 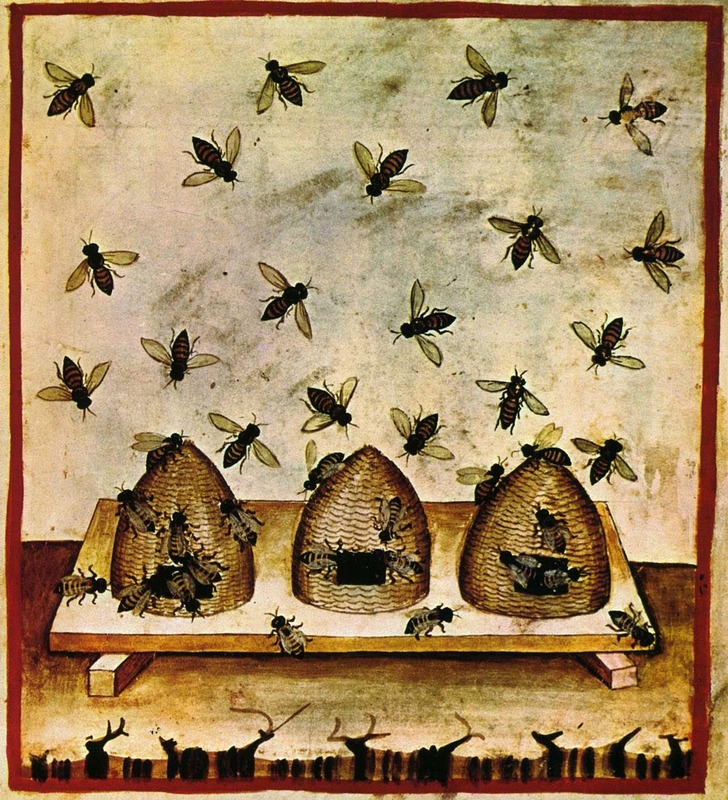 Find out which royal family in Bordentown had the bee as their symbol. Make a bee hat, do bee themed activities, and so much more! The program begins at 2:00 pm and ends at 4:00 pm. $5 per person. Program takes place at the Corson Poly Center, with entrances at 457 High Street and 454 Lawrence Street, Burlington, NJ. For more information, call 609-386-4773, ext. 1, e-mail burlcohistsocprograms@verizon.net, or visit www.burlingtoncountyhistoricalsociety.org. On Saturday, visit Historic Longstreet Farm in Holmdel as Rebecca Reel’s quilters from Middletown will be demonstrating and exhibiting some of their quilts. This free event runs from 10:00 am - 3:00 pm. Historic Longstreet Farm is located at 44 Longstreet Road, Holmdel, NJ. For more information, call 732-946-3758 or visit www.monmouthcountyparks.com. The houses of grist miller John Phillips, his farmer-son Henry and Henry’s blacksmith-son Lewis will be featured during a 90 minute walking tour, hosted by Howell Farm historian Larry Kidder on Saturday. A tour of the Pleasant Valley Schoolhouse is included. Transportation to the historic houses is available for those needing assistance. The walking tour begins at 1:00 pm. Tours of the farmhouse exterior will be held at 11:00 am, 12:00 noon, 2:30 pm and 3:30 pm. Please join the Meadows Foundation at Hageman Farm, 209 S. Middlebush Road, Somerset, on Saturday at 2:00 pm when they welcome Admiral David Farragut. Farragut joined the Navy as a Midshipman at the age of 9 in 1810. He fought in the War of 1812, serving under Captain David Porter. In April 1862, Flag Officer Farragut commanded the West Gulf Blockading Squadron, with his flagship the USS Hartford. After a heavy bombardment, Farragut ran past the Fort Jackson, Fort St. Philip, and the Chalmette batteries to take the city and port of New Orleans on April 29, a decisive event in the war. Congress honored him by creating the rank of Rear Admiral on July 16, 1862, a rank never before used in the U.S. Navy. On August 5, 1864, Farragut won another great victory in the Battle of Mobile Bay. Mobile was then the Confederacy's last major port open on the Gulf of Mexico. Admiral Farragut will be portrayed by Bruce Tucker, a history lecturer at Rutgers University School of Continuing Education, Naval Historian, and Living History presenter. Tickets are $15 each, and may be reserved by e-mail: chrisflp@aol.com. Refreshments will be served. The Continental Army encampment comes to life! 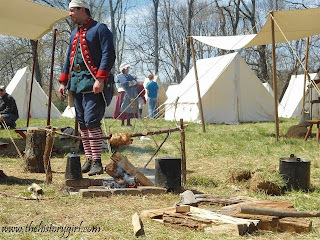 Join us the weekend of May 16th and 17th as soldiers, their wives and their children return to Jockey Hollow for our Encampment Weekend. It's an event full of activities for the whole family. *10:00 am: Camp Opens: The Continental Army resumes their encampment of Jockey Hollow. 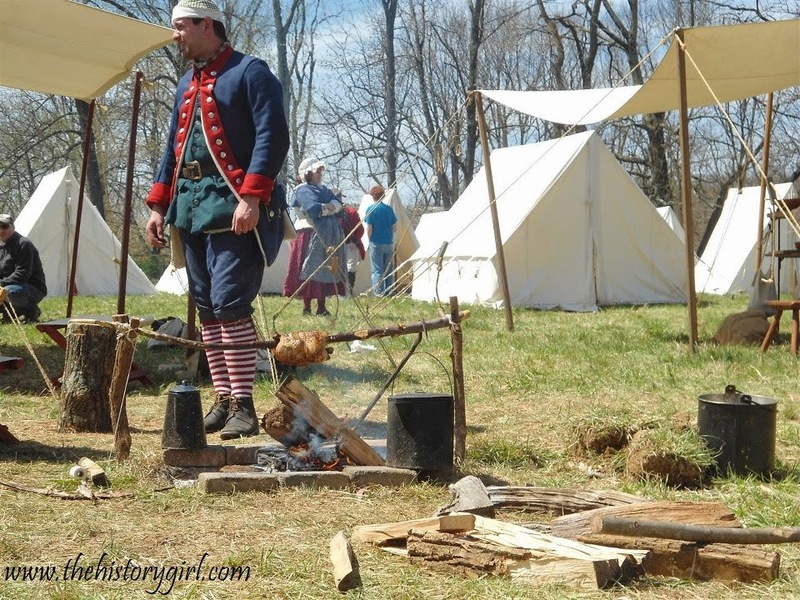 Come and meet the soldiers and camp followers as they drill, prepare food and talk about how they survived the "Hard Winter." *11:00 am: Inspection of the Troops: Soldiers were inspected daily in the camp. Watch as the park historic weapons safety officer inspects the reenactors weapons and the soldiers go through the manual of arms. *12:00 noon: Children's Drill: Kids can become new recruits and try their hands at the musket drill under the watchful eye of the drill sergeant at the Wick House. *1:00 pm: Military Drill Demonstration: Hear the crack of the musket as soldiers demonstrate infantry maneuvers of the Revolutionary War. *1:30 pm: Children's Drill: Kids can become new recruits and try their hands at the musket drill under the watchful eye of the drill sergeant at the Wick House. *2:15 pm: Court Martial of Troops: Become an actor and take part in the Court-martial play, where you decide the guilt or innocence of the accused. *3:30 pm: Military Drill Demonstration: Hear the crack of the musket as soldiers demonstrate infantry maneuvers of the Revolutionary War. *4:30 pm: Evening Historical Walk: Join a park ranger for a short one mile hike from the Wick House to the Connecticut Line and back. Hear about mutinies, murder and the various men and women who lived along the old Elizabeth Road in 1780. Cost: Free. Jockey Hollow is located within Morristown National Historical Park, 580 Jockey Hollow Road (approximate), Morristown, NJ. For more information, call 973-543-4030 or visit www.nps.gov/morr. The Friends of the Medicine Wheel Group of The Heritage & Agriculture Association are busily preparing for the 7th Annual Medicine Wheel Community Garden Celebration & Festival, which will be held at Lusscroft on Saturday and Sunday. This two-day event will again feature workshops and seminars, artisans and crafters, a pop-up art gallery, garden tours, a plant sale, live music, food, art and community. $5 suggested donation per person and children are free. The event will open on Saturday at 9:30 am and on Sunday at 10:00 am. The event will close at dusk each day. Lusscroft Farm is located at 50 Neilson Road, Wantage, NJ. For more information, call 973-222-9651 or visit www.lusscroftfarm.com. Antique high-wheel bicycles, live Dixieland music, Victorian games, a demonstration cricket game, birthday cake, and a tree planting will be part of Victorian Day, a celebration of the 110th anniversary of Essex County Anderson Park, which opened in 1905 as part of the pioneering Essex County Parks System. The public is invited to this free event on Sunday from 12:00 noon - 3:00 pm to sample pastime pleasures as they might have been during 1905 in this Olmsted-designed park, now on the National Register of Historic Places. Visitors are encouraged to spread out a blanket, unpack a picnic, and enjoy a leisurely afternoon. The event is sponsored by Friends of Anderson Park, the Essex County Department of Parks, Recreation and Cultural Affairs, the Montclair Historical Society, Bike&Walk Montclair, the Northern New Jersey chapter of the Victorian Society, the Montclair Cricket Club, and Studio Montclair. 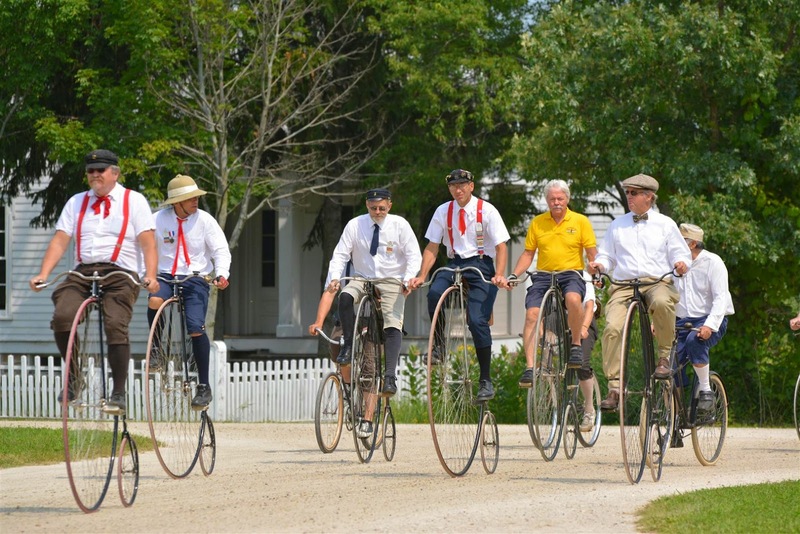 The event features members of The Wheelmen, who collect and ride bicycles made before 1918, displaying a line-up of vintage bicycles, including a penny-farthing, or high-wheel. The Wheelmen have a special connection to Anderson Park: The landscape architect Downing Vaux, who played an instrumental role in the park’s creation, was a founding member of the League of American Wheelmen in 1880. In the decades before cars dominated, that group and other bicycle enthusiasts advocated for paving bumpy dirt roads. 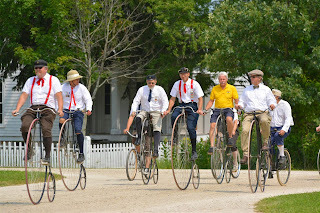 Wheelmen will be present to talk about cycling in Victorian times. In its early days, Anderson Park had a handful of grass tennis courts on what is now a playing field and meadow. On Victorian Day, the greensward will be the setting for classic lawn games from the 19th and early 20th centuries, such as quoits, graces, croquet, and badminton. From 12:00 noon - 3:00 pm, Brian Nalepka of the Richard Stillman Band will be leading a lively Dixieland trio. At 12:30 pm, a maple tree-planting ceremony will take place with officials from Essex County and Montclair Township. Starting at 1:00 pm, the grounds will become the setting for a demonstration cricket match with the Montclair Cricket Club. This British sport was avidly played in Anderson Park from 1905 to 1921, back when the athletes belonged to the Bellevue Cricket Club. The game may have been imported by British train engineers who came to work on the expanding railroads. In Upper Montclair, one of its biggest champions of the sport was R.U. Delapenha, an importer of fancy British foods who founded the Bellevue Cricket Club. Essex County Anderson Park is located at 274 Bellevue Avenue, at the corner of North Mountain Avenue, in Upper Montclair. For more information call 973-477-7207, e-mail info@friendsofandersonpark.com or visit www.friendsofandersonpark.com. On Sunday from 12:00 noon - 5:00 pm, Rockingham will offer its Annual Children's Day. The site will be offering activities and demonstrations of 18th-century life with support from the Montgomery High School Live Historians Club and the Rockingham Association. In addition to some of our regular activities such as trying on replica 18th-century clothing and learning to write with quill and ink, this year children will have the opportunity to play historic games like Battledore and Shuttlecock and Trap Ball, an early form of baseball or try crafts such as making paper aprons and paper baskets. Past Muster will be on hand to talk about soldier's life and musket drilling and the house will be open for mini tours. The new barn will be open and if the weather is inclement, will be used to house some of the activities. You can visit the Museum Store with its many interesting wares and trinkets for sale and there will be light refreshments available. No registration is required. Admission to the event is FREE and will be held rain or shine. Rockingham is located at 84 Laurel Avenue, Franklin Township, NJ. For further information, call 609-683-7132 or visit www.rockingham.net. Sunday's Coastal Defenses Day at Sandy Hook showcases Fort Hancock's critical role in the defense of New York Harbor from the Spanish-American War through the 1970s. From 12:00 noon - 4:30 pm, living historians from the Army Ground Forces Association bring Battery Gunnison and its six-inch guns to life as they were in May 1943. Visitors can help load the artillery guns, visit the magazine and learn how soldiers faced down the threat of Nazi Germany's U-Boats forces prowling off the Atlantic Coast. Also on Sunday will be the grand reopening of History House, which has been closed since Hurricane Sandy! The house will be open from 1:00 - 5:00 pm! The house is an 1898 lieutenant's residence along Officer's Row, furnished in the 1940s manner when Fort Hancock saw its peak population. Living historians in period attire will discuss life on the home front at the fort. 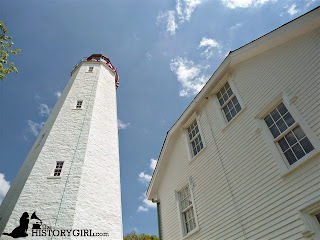 The Sandy Hook Lighthouse and Lighthouse Keepers Quarters / Visitor Center is also open and tours of the lighthouse will be offered on a first-come, first-served basis from 1:00 - 4:30 pm. All events are free and open to the public. The entrance to Sandy Hook is 128 South Hartshorne Drive, Highlands, NJ. For more information, visit www.armygroundforces.org or www.nps.gov/gate. On Sunday at 12:00 noon and 1:15, the Old North Reformed Church in Dumont opens its doors for tours with local historian Carol Banicki. Tours are FREE and no reservations are required. The Old North Reformed Church is located at 120 Washington Avenue, Dumont, NJ. For more information, call 201-385-2243 or e-mail oldnorthdumont@gmail.com. The Cranford Historical Society presents "Cranford Heritage Walk, A Walking tour of Cranford's History" on Sunday. Meet at the Crane-Phillips House Museum at 2:00 p.m. Tour begins promptly at 2:15 pm and will end back at Crane-Phillips House Museum. 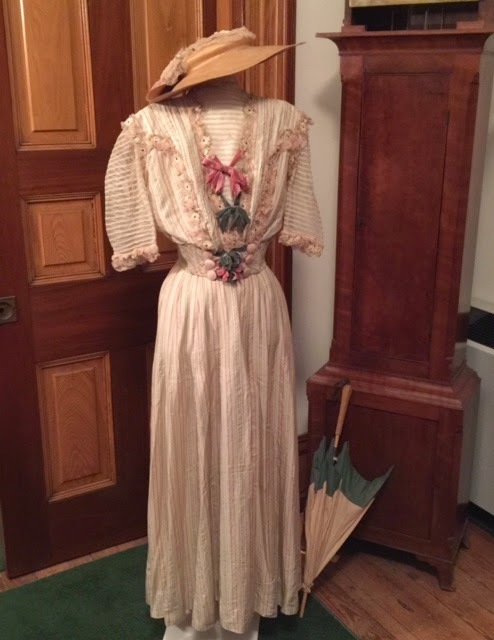 Enjoy a walk back in time as you learn about Cranford's past by visiting important landmarks and homes with Cranford Historical Society Trustee and Education Chairperson Christine Glazer. This walking tour was created for an Eagle Scout Project by Matthew Parlapiano with the help of the late Township Historian Lawrence Fuhro and sponsored by the Cranford Historical Society. Matthew's love of both Cranford and history inspired him to create this Cranford Heritage Walk. There will be one tour. The tour is free but reservations are required. The tour will be canceled if it rains. Today you can visit ALL of the Montclair Historical Society’s properties, with the spring reopening of the Shultz House at 30 North Mountain Avenue, Montclair, NJ. This amazing gem of a house is an intact time capsule of life in the early 20th century. Wait until you see the woodwork, the Delft fireplace surround, the science equipment in the library! Both houses are open from 1:00 - 4:00 pm. Admission is free, but donations are always welcome. Please note there will be a lecture at the Shultz House from 2:00 - 3:00 pm, so please plan your visit accordingly. For more information, call 973-744-1796, e-mail mail@montclairhistorical.org, or visit www.montclairhistorical.org. Throughout the day members of the 3rd New Jersey will be doing demonstrations. 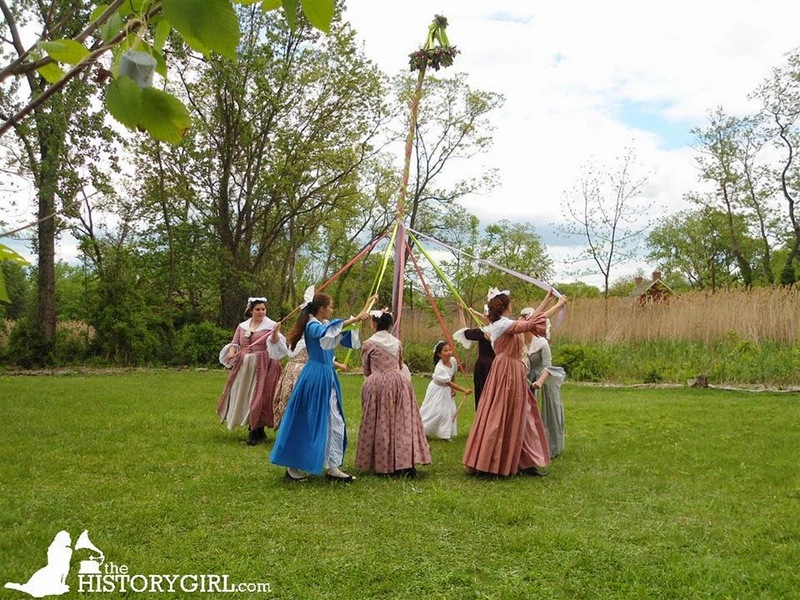 There will be a spinning demonstration in the Demarest House Museum and tours of the Campbell-Christie House garden. Experience history in one of the storied places where it was made! Come to Historic New Bridge Landing, 1201-1209 Main Street, River Edge, NJ. 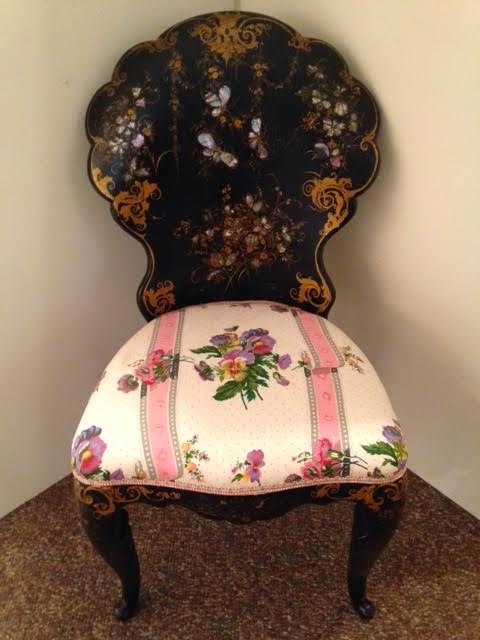 Selections from the collections of the Bergen County Historical Society will be on view in the three Jersey-Dutch houses. Suggested donation: $7 adult, $5 children, BCHS members free. For more information, visit www.bergencountyhistory.org. The Montclair Historical Society will host artist, arts journalist, and author Helen Schwartz presenting "Looking at New Jersey: The Arts and Crafts Movement and How It Changed Our World." The Arts and Crafts Movement was the aesthetic bridge that carried us from an era of Victorian Excess to the simpler forms and easier lifestyle of modernism. Much of the energy for the movement originated in New Jersey as did the revival of interest and activity that continues today. We will look at the movement, past and present, with an eye to what survives and how to find it. The program will be held on Sunday from 2:00 - 3:00 pm at the Shultz House, 30 North Mountain Avenue, Montclair, NJ. The program is free and funded by the Horizons Speakers Bureau of the New Jersey Council for the Humanities, a state partner of the National Endowment for the Humanities. For more information, call 973-744-1796, e-mail mail@montclairhistorical.org, or visit www.montclairhistorical.org. Join us at the Mahwah Museum as Gail Doscher gives a Gallery Talk about the history of Mahwah's Schools at the Mahwah Museum on Sunday at 1:15 pm. 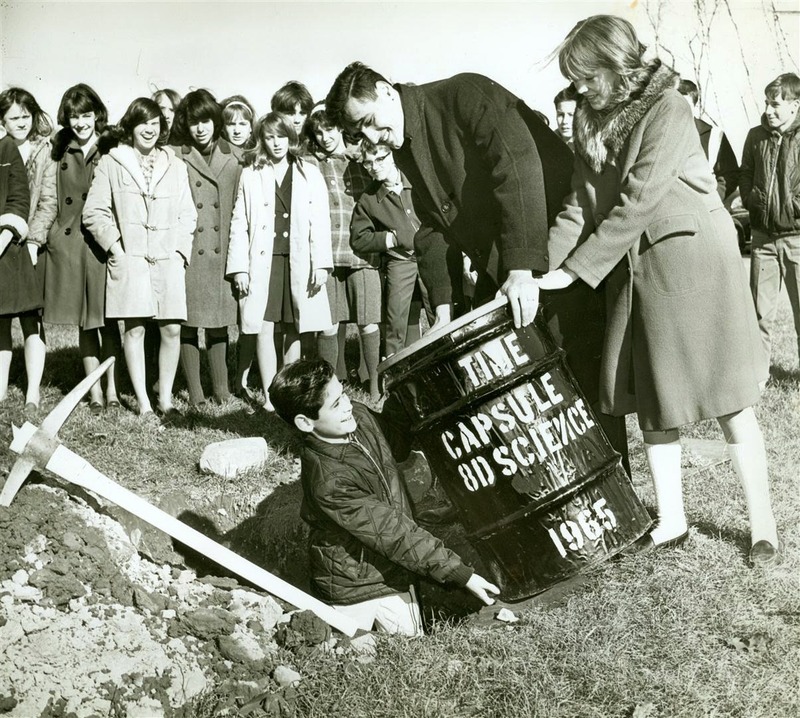 The Mahwah School System from its early beginnings to present day will be discussed. Did you know there are four buildings standing today that were once one-room schoolhouses? Find out about them and what it was like to attend a one-room school. If you have an old photo of you at school in Mahwah, bring it along! Gail Doscher, a retired teacher, is a former Mahwah Museum Trustee and long-time volunteer and docent. As past chair of the Museum's lecture series she has hosted many interesting and informative programs; she has also given talks for school groups and museum visitors. Gallery talks are included with museum admission ($5 per adult, $3 per child over 5 under 12, free per child under 5, and family $10). Seating is limited; reservations are strongly suggested to ensure a seat. Call 201-512-0099 or e-mail gallerytalks@mahwahmuseum.org for reservations. 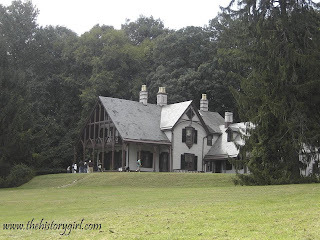 The Mahwah Museum is located at 201 Franklin Turnpike, Mahwah, NJ. For more information, visit www.mahwahmuseum.org. It's a Yankee Doodle Celebration! On Sunday from 2:00 - 3:30, children will learn about the origins of the song “Yankee Doodle,” make a Yankee Doodle hat, and participate in a little parade with music around the grounds of the museum. Fun for ages 3-7. Light refreshments will be served. The museum will also celebrate the 275th anniversary of the Miller-Cory House and dedicate its new commemorative walkway in the lovely herb garden with a short program at 3:30 pm. The public is invited to attend the ceremony. Early colonists faced many challenges, not the least of which was cloth necessary for daily life. The process began with growing flax that was harvested and spun into thread to be woven into linen. The equipment used in this process will be on display and demonstrated. Follow the process of flax from seed to flowering to drying to teasing out the casing with a heckle. The result is a silky fiber ready for spinning. Demonstrations will be held at noon and 2:00 pm with a tour immediately following each demonstration. Admission is free. Reservations are recommended as seating is limited. Peachfield is located at 180 Burrs Road, Westampton, NJ. For more information and to register, call 609-267-6996, or e-mail colonialdamesnj@comcast.net. Aye, matie! Absecon Lighthouse is hosting a day for young seafarers to come and experience a swashbuckling good time! The Philadelphia Fight Ensemble will present their live rapier skills in a show full of exciting swordplay and comedy for young and old. Trade quips with notorious Buccaneers, thrill as historical figures engage the audience with their swords whilst passing on a bit of their history through interactive fun. But, that's not all! Kids will enjoy crafts and Pirate "Jeoparrrrghdy," a scavenger hunt, goodie bag surprises and snacks, and a thrilling climb to the top of the Lighthouse to look out for the ghosts of shipwrecks. Dress as your favorite pirate! Admission is $12 for kids and $6 for adults. PLUS! The first 120 visitors to check in will be treated to tickets for a cruise out of Gardner's Basin on Atlantic City Cruises 'Cruisin One. The lighthouse is open from 11:00 am - 4:00 pm. The show will be presented at 1:00 pm and the cruise leaves at 3:00 pm. Guests can climb and enjoy all activities prior to or after the show. On Sunday, celebrate the Walpack Historical Society's 30th Anniversary with a Homecoming Church Service at the Walpack M.E. Church, Main Street in Walpack Center, within the Delaware Water Gap National Recreation Area, Sussex County, NJ at 1:00 p.m. The service will be followed by early views of Walpack and vicinity, a slide show by Mike Orlowski. This event is free and the public is welcome. The Walpack Historical Society is looking for images of former pastors, weddings, and other events held at this church which has a very interesting trompe-l'œil interior. For more information, please call 973-948-4903 or visit www.walpackhistory.org. 2015 Annual Meeting and Program: "An Apple Orchard for William Trent"
In anticipation of recreating a historically accurate orchard on the property of the William Trent House, historic horticulturist Charlie Thomforde will present a fascinating program about America's favorite fruit, the apple, and its place in the colonies. Many of the heirloom varieties of apple were cultivated in colonial New Jersey or nearby Pennsylvania, and they were used for cooking, eating raw, and especially for hard cider making. Refreshments will be served beginning at 1:00 pm and the program starts at 1:30 pm. Free and open to the public. No RSVP necessary. Built in 1719, the magnificent Trent House is the oldest building in our state capital. Listed on the National Register of Historic Places, it is restored and carefully furnished as it would have been in the early 18th century. Located at 15 Market Street in Trenton, adjacent to the Hughes Justice Complex. Ample free parking. For more information, call 609-989-0087 or visit www.williamtrenthouse.org. The Pascack Historical Society will explore a rich, but vastly unexplored area of local history cemeteries at "Beauty in the Cemetery," on Sunday at 2:00 pm. Guest speakers Peggy Norris and Joe Suplicki bring decades of research and exploration to their talk. 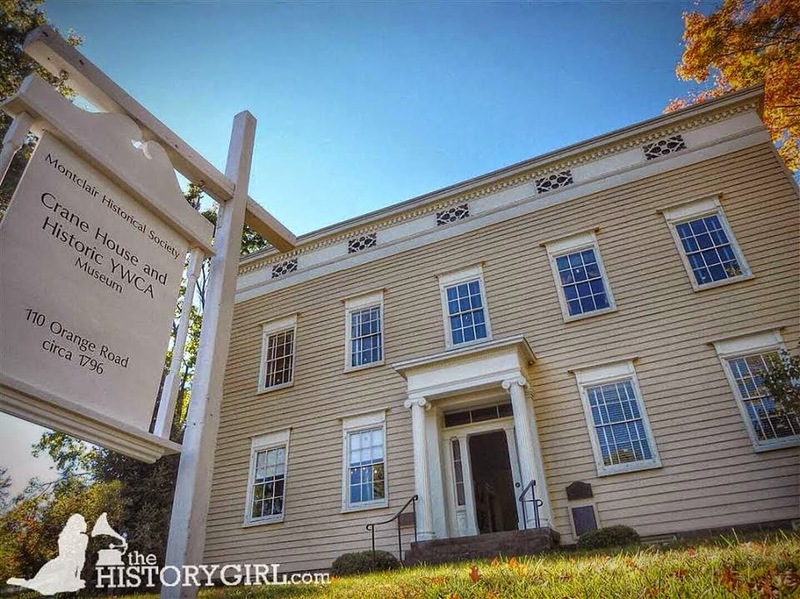 The noted husband and wife team serve as Ridgewood's Village Historians and have presented many programs together on diverse historical subjects. They became interested in cemetery research about seven years ago and have been studying and taking pictures ever since. They will show some local tombstones as examples during their talk. Gravestones are really America's first sculptured artwork. They are the only artifacts which are dated and remain in their original locations. Most gravestone carvers were tradesmen or farmers, who could read and write, for whom stone cutting was a secondary occupation. It is thought that most carvers copied lettering styles from their school books. Each generation had different designs commemorating the death of loved ones. Artisans have left their designs behind for posterity, many displaying their identifying signatures as well. A question and answer period will follow the talk. Complimentary homemade coffee and cake. Free admission to the barrier-free museum. Children welcome when accompanied by an adult. 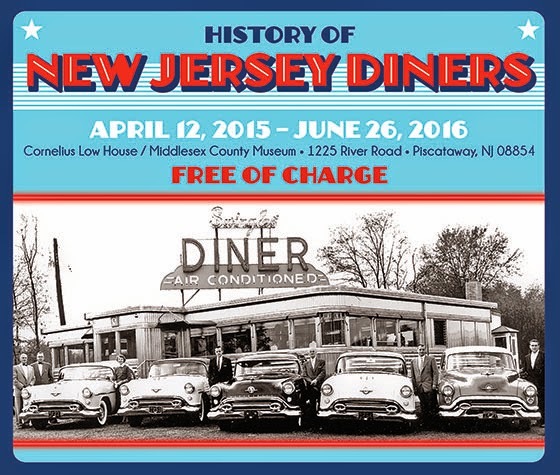 The Pascack Historical Society is located at 19 Ridge Avenue, Park Ridge, NJ. For more information, call 201-573-0307 or visit www.pascackhistoricalsociety.org. Spend Sunday at the Whippany Railway Museum helping them celebrate their 50th birthday! The 2015 Railway Hobby Show will be set up on the Great Lawn of the Whippany Station from 11:00 am - 4:00 pm, where vendors will offer everything from railroad models, lanterns, photos, history books, etc. Excursion trains will be running at 1:00, 2:00, 3:00, and 4:00 pm (all sold out). Tour the museum and see all of the great trains on-site. The Whippany Railway Museum is located at 1 Railroad Plaza at the Intersection of Route 10 West & Whippany Road in Whippany, NJ. The "Excursion Train Ride" is a fundraising effort to benefit the Whippany Railway Museum, a 501 (c)3 non-profit Operating Heritage Railroad that is staffed by volunteers. Donations from the public help to keep the museum operational, but funds are still required to support this unique New Jersey treasure. Proceeds from the train rides will further enhance the Museum's mission and its historic preservation efforts. For more information, call 973-887-8177 or visit www.whippanyrailwaymuseum.net. The Steering Committee of the Woodbridge Township Heritage Tourism Project invites you to "The Old Neighborhood: A Stroll Down Memory Lane," a group interview of three long-time Woodbridge residents on Sunday at 2:00 pm. Township Historian Brenda Velasco will lead a group interview of Sophie Bader, Frank Caparo, and Harry Bernstein. Each person will be asked to share their recollections of growing up in Woodbridge during the 1940's to the 1960s. After the group interview, light refreshments will be served. This event will take place in the Woodbridge Middle School Auditorium, 525 Barron Ave, Woodbridge, NJ. This is a fundraiser for the Historical Association of Woodbridge Township, to support their efforts to create a Woodbridge History Center. A donation of $5.00 per person is suggested at the door. Channel 35 Woodbridge Township Cable TV will be filming during this presentation for future broadcast. For more information, call 732-634-4500 or e-mail wthpc1699@hotmail.com. On Sunday at 2:00 pm, the Chatham Township Historical Society will present a program on Edgar Holden, M.D. given by Sandra Moss, M.D. Upon graduation in 1861 from the College of Physicians and Surgeons in New York, Edgar Holden entered the Union Navy as a surgeon during the Civil War. He witnessed the Battle of the Monitor and the Merrimack (Virginia) and subsequently served as medical officer on the Passaic, the Union's second monitor-class ironclad. Later, he became a prominent Newark physician, was an early specialist in laryngology, conducted extensive research in medical technology, served for 39 years as the medical director for a national life insurance company, used his wide-ranging talents in writing, sketching and painting and, in retirement, lived on a summer estate in Chatham Township. Sandra Moss is a retired internist and has a Master's degree in the history of medicine from Rutgers. Her interests center on 19th-century medicine and the medical history of New Jersey. 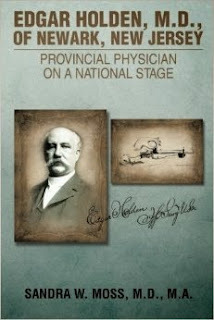 She recently completed a new book, Edgar Holden, M.D., of Newark: Provincial Physician on a National Stage. This program will be held at the Chatham Township Municipal Building, 58 Meyersville Road, Chatham Township, NJ. For more information, visit www.chathamtownshiphistoricalsociety.org. On Sunday morning at 9:00 am, join the Washington Crossing Park Association and George Washington for the first walk to raise community support for the Johnson Ferry House's fund for restoration and educational advancement at Washington Crossing State Park. Registration starts at 8:15 am at the Washington Crossing State Park's Visitor Center and Museum, Titusville, NJ. The one-mile walk, led by General Washington, begins at 9:00 am. For more information, e-mail Bill at wrmarsch@earthlink.net.